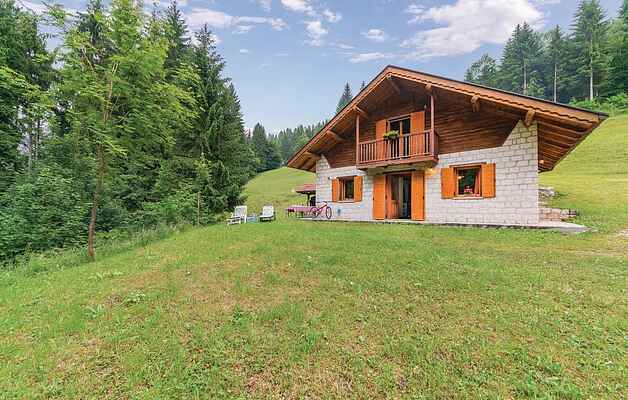 This holiday home in Sovramonte, 14 km from Feltre, in the Belluno Dolomites National Park, is dedicated to those who love the solitude and silence of the forest, but at the same time they do not want to be too far from the main tourist attractions like the cities of art (Belluno 55 km, Vicenza and Treviso 85 km, Venice 120 km) and from Trentino with mountains and beautiful lakes. The house welcomes guests with the typical warmth of mountain homes. In summer, the outdoor fireplace with the barbecue becomes the main attraction of the house and in the beautiful lawn you can sunbathe while the children play. At 5 km from the house you find to the ski resort Croce d'Aune - Monte Avena, a ski resort dedicated to the family, away from the most famous ski slopes of skiers. But for those who want to diversify, the "snow" offer is among the most complete and extends between the Veneto and Trentino Dolomites: 40 km from the San Martino di Castrozza Ski Area and Passo Rolle; at 70 km the Falcade -San Pellegrino and the Civetta Ski area. From the house you can leave for excursions on foot, either by following quieter routes that cross the Sovramonte plateau, or by trekking along more demanding itineraries such as the Alta Via 2 of the Belluno Dolomites Park. For the more adventurous, the favorable air currents make the Monte Avena the ideal base for flights with paragliding or hang-gliding and in the valley you can practice canyoning and the nearby lakes (Corlo 20 km, Levico Lake and Caldonazzo 60 km , Calaita Lake 35 km and Santa Croce Lake 73 km.) offer the opportunity to practice water sports such as windsurfing, sailing, kitesurfing, but are also suitable for those who simply want to relax, take a dip or sun bath. The house is also an excellent starting point for historical-artistic itineraries that cross cities rich in art (Venice, Feltre, Belluno, Bassano del Grappa, Mel, Treviso, Vicenza, Trento, Rovereto), charming historic villages, to discover the immense heritage of the Venetian Villas and the charm of the Castles of Trentino. Not to forget the rich local food and wine offer: in addition to the numerous restaurants and trattorias with traditional folk specialties, the area, during the summer, is a succession of local fairs dedicated to local products. For beer lovers, in Pedavena (10 km), there is a historic brewery with a wide selection of beers, famous throughout Europe. And in this holiday you can not miss a day trip dedicated to wandering the beautiful hills of Valdobbiadene (45 km) or Breganze (60 km), in an itinerary that winds between vines and cellars, where you can stop to taste a glass of Prosecco or of Cartizze or of Torcolato. A bedroom upstairs has a wooden terrace from which to admire the wonderful view of the mountains and roe deer that in the morning pass near the house. You can reach the house along a winding uphill road: last 100 m dirt road.